Yay! Ice Cream! I realise that this makes me sound very, very grown-up, but I can explain. I've never really liked ice cream. Too cold. I hate being cold. That's also why I don't really like swimming in the sea, or living in Wellington, for that matter. The cold makes your muscles all tense up, and your teeth chatter, which is very unlady-like, let's be honest. So, no thank you for ice cream, until one day, in a fit of adventurism, I bought an ice cream maker. I blame my mother. She is so into appliances, she'll have two bread makers if she could find the space. Some of this love for electronic food helpers must have rubbed off on me, because I suddenly found myself with an ice cream maker. Can't tell you how it happened, it's all a bit blur, really. The inaugural batch I whipped up in my new baby was roasted cinnamon ice cream, and it was the best dessert I've ever had. And just like that, I was hooked. Suddenly I had years and years of ice cream eating - and making - to catch up on. What a great dessert. It's at the same time fun and therapeutic to make it (all that hypnotic stirring of the custard), and if you do it right, the result is heaven. Cold, yes, but so delicious, the temperature doesn't seem to be an issue. It's the melting in the mouth that make it a tactile experience along with the taste, a little bit like chocolate. Anyway, point is, we were not rich. So when I walked into a book shop one day and saw the most beautiful ice cream book, A Passion for Ice cream, by Emily Luchetti, I had to have it. Here was a book with page after page of the most delicious ice cream recipes I've ever seen, with cakes and cookies and other fabulous things to eat thrown in, obviously just to brag about how good she really is. Then I saw the price. There was absolutely no way I could afford to pay $90 for a book on ice creams. So I paged through it, and drooled, and thought about buying lottery tickets, and walked away empty-handed. Then, a few months later, the same book shop had a sale, and lo and behold, same lovely book, new lovely price - 60% off! This was towards the end of my stay in New Zealand, and the book was carefully packed and shipped across the Tasman Sea to my new home country, Australia, where, once arrived, I looked at it all the time, but didn't make any of the lovely recipes, as my lovely new husband's bachelor pad had only a small bachelor fridge with teeny tiny freezer compartment. Hardly any space for a bag of frozen prawns, let alone an ice cream maker bowl. The two ice creams I decided to make was a banana one, and a milk chocolate one with chocolate covered pecans, and yes, it does taste as divine as it sounds, but I'm getting ahead of myself. 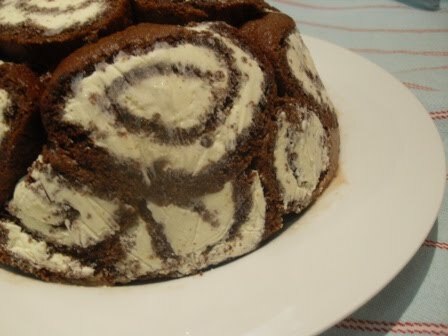 First of all, the swiss roll cake. Fiddly, but delicious. Will I make it again? Not sure if it's delicious enough to warrant the fiddliness. The banana ice cream? 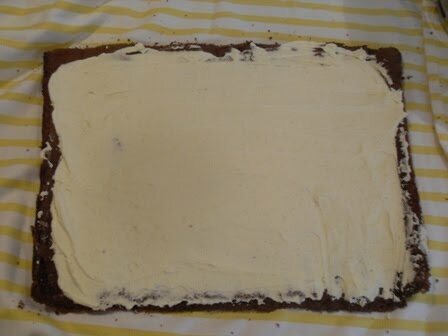 Tasted like pureed bananas, so I ended up using only a tiny bit in a cake. It tasted fine, but I'll be looking for another recipe. The fudge sauce? Easy, but not as good as The Best Chocolate Sauce in the World. Now, for the chocolate ice cream. Looking at the recipe, I toyed with the idea of using dark chocolate instead of milk chocolate, but I'm so glad I didn't. My ultimate favourite Black and Green's chocolate stole the show. It was lovely and sweet, with a touch of richness that I want to describe as smoky, except that's not exactly it. And that's just the background. The chocolate covered pecans were so good, I'm forever going to cover my chopped nuts in chocolate before using them in any recipe ever again. It was divine. All I can do is implore you to try this ice cream. Please! Pretty please! You will not be disappointed. The cake was such a big job that took me 3 days to complete, working with a tiny freezer and a lovely Little Girl wanting hugs and kisses all the time. I kept on thinking that this is just not worth it. I could be making several other dishes in the same time. Then I tasted the final result, and it's so good, I had it for dinner last night and breakfast this morning. (I don't really see the point of being a grown-up if you can't have cake and ice cream and chocolate fudge sauce all in one for breakfast. I'm sure I'm not alone in thinking this.) 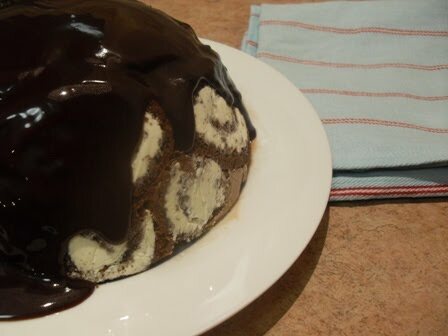 This dessert is a labour of love, maybe made for a birthday, or for Christmas. But very much worth it. Melt the chocolate over boiling water. Remove from the heat and stir in the pecan nuts. Spread in a single layer on a parchment-lined baking tin. Let sit at room temperature until hard, about 1 hour. In a bowl, whisk together the egg yolks, 1/4 cup of the sugar, and the salt. Cook the milk, cream, and remaining 1/2 cup sugar in a heavy saucepan over medium heat, stirring occasionally, until almost simmering. Slowly pour the milk and cream into the egg mixture, whisking as you pour. Whisk in the milk chocolate until it is completely melted. Return the mixture to the saucepan. Cook over medium-low heat, stirring constantly, until the custard lightly coats the spoon. 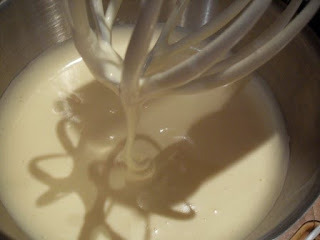 Strain the custard into a clean bowl and cool until room temperaturel. Refrigerate the custard for at least 4 hours or overning. Preheat your oven to 180°C. Put the unpeeled bananas on a baking sheet. Bake for 10 to 15 minutes, until soft and beginning to give off some liquid. Remove the skins from the bananas, and puree the bananas in a food processor. In a bowl, whish together the egg, yolks, half the sugar, and salt in a bowl. Combine the milk, cream and remaining sugar in a heavy saucepan. Cook over medium heat, stirring occasionally, until almost simmering. Slowly pour the milk and cream into the eggs, whisking as you pour. Return the milk mixture to the saucepan. Cook over medium heat, stirring constantly, until the custard coats the back of the spoon. Strain the custard into a clean bowl, and cool in an ice bath. Cover and refrigerate for at least 4 hours, then churn in your ice cream machine. 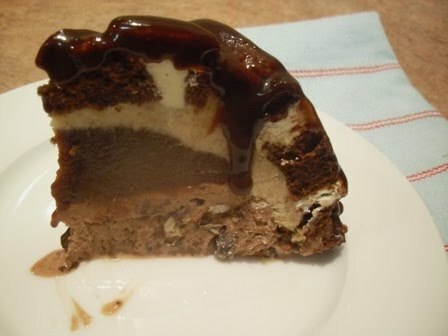 Serve with any leftover fudge sauce, heated up. Oh wow a true labour of love! There's no way I will ever make it but I'd love a taste! I've been experimenting with guava ice creams and parfaits, also delicious. Will post about them soon. sjoe, dit lyk heerlik. ek kan net dink hoe lekker die piesang, neute en sjokolade saam met die roomys en koek moet smaak. Hey, very cool blog, maşa Allah. I'm South Afrıcan, too, so I was pleasantly surprised to see biltong on google when I searched for "beautiful ice cream." Happy baking! Nice to meet you! I'm not blogging at the moment, but hope to be back in a few weeks. Hope to see you again.